The concept of small-scale urban homesteading has come up before in Winnipeg, but like most ideas that depart ever so slightly from the status quo, people assumed that it would make their lives miserable, and it ended up going nowhere. Although it fell on deaf ears, advocates pointed out that other cities in North America have allowed backyard chickens, and have not experienced any real problems. Denver is one of those cities. In 2011, the City of Denver relaxed regulations to allow home owners to keep chickens and goats — yes goats — for a modest one-time fee. The $20 license permits up to 8 chickens or ducks, and up to 2 dwarf goats. Roosters are not allowed because, obviously, they’ll wake up the neighbourhood every morning, and the goats must be female, because we all know what those male goats are like. It seems to have been accepted by the community. Reports of complaints about backyard chickens are hard to come by. One suburb of Denver that also allows residential bee keeping has reported that “there has not been an uptick in complaints“. According to their code enforcement officer “most of the issues revolve around people having too many chickens or not possessing the proper permits.” Issues with the animals themselves are minimal. A handful of chickens, as it turns out, will not cause the neighbourhood’s property values to plummet. 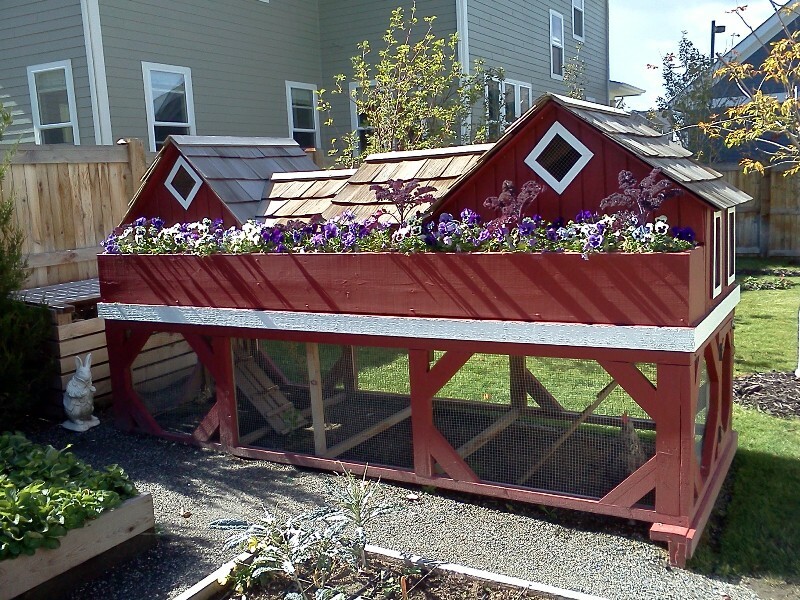 A sign that keeping chickens has truly become accepted is the fact that show homes in new developments sometimes include chicken coops, like the one below, as an added feature. If there is any problem with urban chickens, it seems to be coop fires. It appears that some owners, fearful of their little hens getting cold in the winter, make the mistake of installing heat lamps in their chicken coops which often results in the coop burning down … and tragically delicious fried chicken. When I was a kid we had neighbours that kept ducks in their back yard. While I found them somewhat intriguing, they have nothing to do with my current support for urban fowl. There is a more practical foundation to it. Chickens are amazingly prolific. In her prime, a hen can lay up to an egg per day. Two or three birds will give you breakfast every day. It helps to make home owners a wee bit more self-sufficient, which sits well with the environmentalist part of me. They’re also educational for kids and provide a useful hobby for adults. There is also something less tangible that I like about it. Something about loosening up the stiff uniformity of residential neighbourhoods. I like the notion that people can explore different uses for their property, and depart from the standard wood deck, grass lawn, and tiny corner garden that everybody seems to have. Within reason of course. So here, in the last of my three part Lessons From Denver series, the lesson is pretty simple: urban chickens are okay. Secondary lesson: your chickens will live longer without heat lamps. Other problems that Vancouver hipsters found out the hard way is that the chickens don’t lay eggs their entire lives, and it is also a lot of work.